John Peré has played the steel guitar most of his life and is recognized for his unique style of playing the instrument. John Peré started his music career in December 1948. He played music with many bands in south Louisiana. Peré organized two bands in the 1950's - the “Abbeville Play Boys” and the “Sunshine Play Boys.” Later, he played with the “Happy Fats Band” and also with his brother’s band named “J.B. Pere and the Music Macs,” for five years. 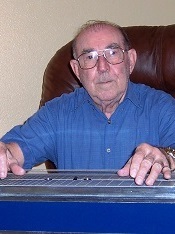 Peré played steel guitar with many other bands for over 50 years. He was especially dedicated and donated his time to play for benefits for the cancer society and the cerebral palsy children fund at the Heymann Center in Lafayette, Louisiana with the “Midnight Riders” band fund, a group he played with until December 2008. John Peré and J. B. Peré are well-known throughout Louisiana and the United States for their music careers, support of Louisiana’s music and their generosity. They have helped many non-profit organizations throughout the area for many worthwhile causes, including the Sammy Kershaw “Sam Jam,” an annual concert held in Kaplan to raise money for community-based organizations.